The LX provides unparalleled range of motion, being able to accommodate a user’s sitting or standing posture. Features include 20 inches (51 cm) of vertical adjustment and 62 inches (157 cm) of side-to-side motion. LX Sit-Stand Keyboard Arm To add an LX Sit-Stand Keyboard Arm to the configuration, order 45-354-026. Attach keyboard arm at base of pole while leaving the arm’s wall-mount base unused. Question: I have two questions about this Ergotron product. First question is my user is 5'7", will this work as a sit/stand option with the pole only being 16"? Secondly, with the dual monitor kit, how heavy can both monitors be and the arm still articulate for sitting/standing? Answer: Even though the pole is only 16", this arm will work as a sit-stand option for your user. If you add a dual monitor kit, the weight capacity of the arm will reduce from 30 lbs to 24 lbs as the dual monitor kit adds 6 lbs weight of its own. Also both the monitors need to be between 17-24" in screen size with an outside width of 14-24.5". Even if you add the dual monitor kit, arm will still articulate for sitting/standing, that is, 20" height adjustment. 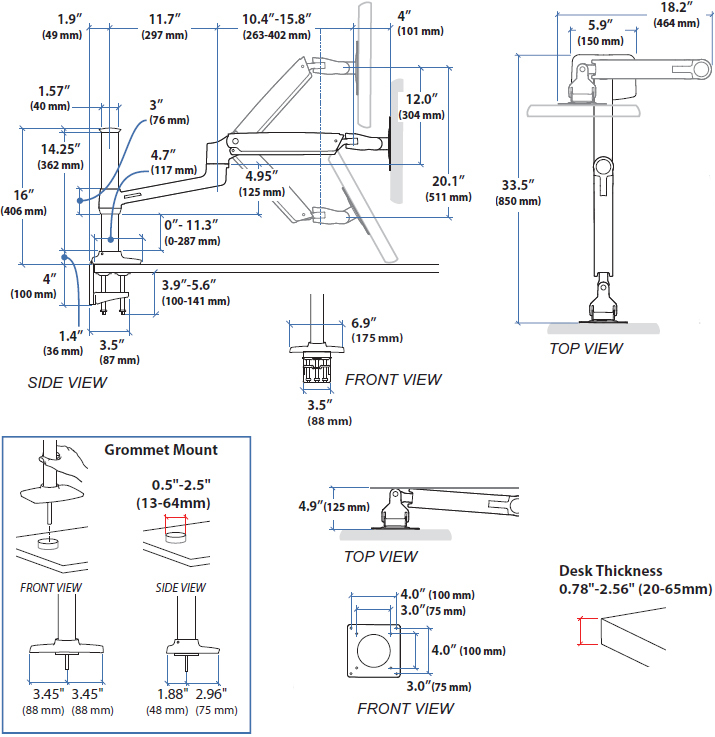 Question: With the Ergotron 45-384-026 clamped onto a desk, at its highest extension how many inches above the desk does it hold the monitor? I know that'll ultimately vary by monitor size but just trying to understand how many inches higher this provides at its peak. Also, just to confirm is it flexible enough so that at its lowest point it holds the monitor as low as the surface of the desk? Answer: At its highest extension, the LX HD Sit-Stand Mount Monitor arm is 26” above the desk from the center of the monitor. The post is 16”, so if you mount the arm at the top of the post, plus the 10” height adjustment (arm adjust 10” up and 10” down), you get the 26” at the highest at the center of the monitor. Yes, it is flexible enough it can go as low as hitting the bottom of the surface of the desk. Monitor Size Up to 46"
Excellent product. Easy to install. Versatile and easily changes to whatever position you need. Since there is no bulky desk stand it leaves the desk uncluttered, neat and tidy with more usable space. We used this product to mount a TV in our living area. It was easy to mount and very sturdy. This is great product in both function and appearance. I got this arm for my new cintiq 27" and it works perfectly for all of my digital art needs allowing me to set it up in really any position I might need it in. Purchasing it I was a little afraid of it potentially dipping down because of the weight of my cintiq but after adjusting the tenting it doesn't dip at all. If you need or want this kind of range of motion for digital art or otherwise this is what you're looking for. 2 of 3 voted this review as helpful Was this review helpful to you? You get what you pay for, a well made solid sturdy stand. I mounted a 27 inch Imac, installation was a breeze. Monitor floats nicely, only thing is I regret not ordering the handle and maybe the keyboard attachment. This product is everything I wanted and more. Really heavy duty. I use it to hold up a 27inch Cintiq display on my desk. It allows me to move the monitor any way I want including elevating it enough so I can draw standing up. I installed the unit by drilling a hole in my desk because the frame of the desk at the edge isn't wide enough to hold anything. I would recommend this approach because, also it is more hassle, it is VERY solid. I don't normally write reviews of products, but I love this thing so much I feel I should. I was considering some of the other sit/stand options like the whole desktop that raises or the self contained monitor and keyboard type that slides up and down. I'm glad I settled on this, it gives me more options IMO. When I'm standing the proper height for the keyboard is always the same, so I found a nice monitor stand that is just the right height and place my keyboard and mouse on that. So when I'm sitting or standing the options to adjust everything in and out or up and down are endless. And it seems to be really, really well built, totally worth the price. I wanted a sit stand work area. My cube has an adjustable-height keyboard area. I had Facilities raise the entire desk, so that the keyboard area lowest point was comfortable for sitting, and the keyboard area highest point was comfortable for standing. Now I just needed to adjust the monitor height. I chose this monitor arm because I have a large, heavier monitor, and this monitor arm could easily handle it. The vertical travel is enough to to match my eyeline both sitting and standing. I easilty mounted it to the desk with the clamp mechanism. After adjusting the tension, with two fingers I can raise or lower the monitor quickly. It doesn't shake. My colleagues are jealous. This has solved my work space issue. I can stand, sit, move the monitor out of the way when I need the extra desk space, etc. It is very well made. Solid as a rock -- Very well made. When looking for an arm to support a 32" monitor over a rather expensive audio recording console I wanted a quality product. The Ergotron arm was recommended to me by a close industry contact and am I ever pleased. This item is quite well engineered, constructed to a very high level of quality, easy to assemble and put into operation. Well worth the investment and highly recommended.